Self-promotion: like most things, it’s who you know that counts. A week ago I listed Particular Stupidities (R&M File #5) as available for pre-order from Amazon. For the first time in my self-publishing career (better late than never) I then went on to make a bit of a nuisance of myself on social-media. My aim was to raise awareness in the hope that readers would pre-order the book and in turn get it up the Amazon charts and noticed, maybe even attract the interest of Amazon’s recommended reading list that it emails out to readers. When one is releasing a new book, it’s definitely a list you want to get on. As well as putting out a blog-post and linking it to my Facebook and Twitter accounts I sent a lot of tweets to a lot of Twitter accounts that I’d chosen because I hoped they might be suggestible. (For fun, I even tweeted a couple of best-selling authors whose names popped up on the screen as I was networking away.) I learned something from the exercise that is worth sharing with others who might be seeking self-promotion ideas. The response from readers who follow the blog and are Facebook and Twitter friends of mine was very encouraging. Once again, a massive and heartfelt thank you to everyone who not only pre-ordered a copy of the book but who then went on to share my links with their own lists of friends on social media sites. As I’ve already blogged since listing the book it briefly broke into Amazon’s top 1000 list (I’m pretty sure that was a first for one of my books.) It’s drifted out now, currently @ #1825, which is still good. I’m certainly not complaining. The dozens and dozens of hopeful tweets to unknowns (ebook promoters, readers I don’t know, the famous authors and just about every news media outlet involved in the south-east where the R&M Files are set) only achieved one retweet (thanks to Whitstable Live), which makes the effort seem generally wasted. I tweeted all the newspapers local to the R&M Files and didn’t get one retweet or reply. Total waste of time #justsaying. I admit to having been a poor self-promoter. I still am – it’s an energy thing. Going on the evidence, such as it is, I would have done well to have taken a leaf out of the books of other successful self-promoting authors and organised a mailing list that readers could subscribe to. I could then have emailed directly all those readers who would have signed up to being notified of my forthcoming releases. I’m sure it would have been a smart move for me the self-publishing author. Will I do it now? All that said, it’s my understanding that there is no greater boost for an author’s chance of downloads than to get onto Amazon’s radar. If a title comes to Amazon’s notice as something people are downloading in significant numbers then Amazon get behind you and make you more visible – the more you sell the more they make. Why am I now thinking about Joseph Heller? Writers are nothing without readers. I’d like to express my sincere gratitude to all those who have downloaded, supported and shared R&M File #5. Tonight is the first time one of my books has broken into the top 1000 on Amazon sales chart. Currently it is @ #989 and I’m chuffed to bits. Particular Stupidities (R&M#5) available for discounted pre-order. TAKING A LIFE IS EASY. GETTING AWAY WITH IT CAN BE MURDER. 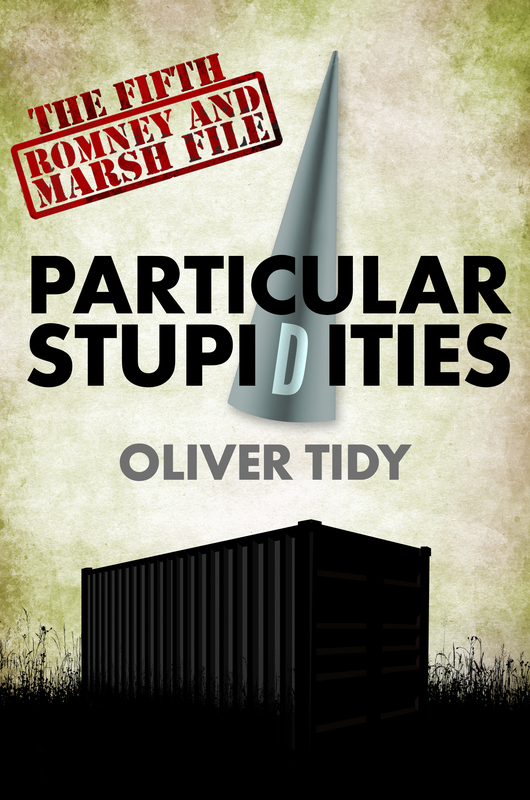 Particular Stupidities (Romney and Marsh File #5) is back from my gentleman friend. Thanks to him for a quick turn around of the book. Now I need to get cracking on reading it through again (probably a couple of times), formatting, and the myriad other tasks that go along with self-publishing a book. Good job I’ve got a week of doing nothing before we quit Istanbul. I mentioned here recently that I would try the Amazon pre-order option with this title. See links for UK and US at the bottom of the page. Release date will be Thursday 30th July. I know that seems a long way off when I already have the book back but I have my reasons (good or otherwise). One of my better reasons is that Thursday, 30th of July is the date I’ll be hosting my author chat with Crime Book Club (See previous post). I thought I’d combine the two dates. You might also notice that the pre-order price for this one is a mere £0.99 in the UK and $1.57 in the US. I will be changing that to the usual £1.99/$3.01. on Friday 31st July so grab a bargain while you can. I’m just trying something different. If you buy a copy and have Twitter or something like it, I’d really appreciate you spreading the word. Readers’ word of mouth is vitally important to self-published authors. A rotting corpse is discovered in one of Kent’s old coal mining communities. In their search to uncover the identities of the victim and those responsible for the death and concealment of the body DI Romney and his team must confront and deal with issues of prejudice, bias, loyalty and betrayal (and that’s just amongst themselves). The fifth Romney and Marsh File sees Dover CID taken to the outskirts of their jurisdiction, the edge of reason and the brink of self-destruction. Some great news to share. Crime Book Club (link above) has invited me to take part in an online author chat session at the end of July. Currently the group has over 1500 members. I’m very excited. It’s a terrific opportunity to raise awareness regarding my writing. As well as crime readers sharing and discussing their views on what they’re reading they also hold those regular author chats. Nıkki Owen and best-selling Rachel Abbott coming up soon. And then I’m in the firing line. Gulp! The lucky winner must pay for everything including meals, unlimited champagne, accommodation in a five star hotel for me and my mum (separate rooms. Make that separate hotels. She will also probably want to join the lucky winner and me for dinner.) Oh, and of course first class return travel to Istanbul for two. Like all sensible, struggling writers I maintain a social media presence. I’m not too in your face with it; just about every Tweet and Facebook status update I make is to announce a new blog post. Today I thought it worth Tweeting and mentioning on FB that I’d just taught my last lesson in a long and distinguished (ahem) teaching career. When I clicked ‘update’ on my FB page to make my status live I noticed that my ‘sharing’ settings were locked on ‘custom’. For me this setting limits any new FB posting to about five family members. (I use it when I want to share something a bit private.) And the light of realisation winked at me through the curtains of my ignorance. If I’m right about those settings (you’d think I’d be able to look back and see but I can’t understand how I would do that) then I feel a bit stupid and a bit cross with myself. Writers need social media to keep themselves visible and to spread the word about their writing. Oh well. Lesson learned. Another one. I’m off to make a cup of tea and contemplate my new life. First up: bonfire of the neck-ties at my place tonight. And lots and lots of beer. This blog is my writer’s diary. I try to make one entry a week. The entries are mostly about my journey as a writer. This week I have some significant news to record for posterity regarding my writing life. I’ve known my news for a while but have waited to share here until the time was right. This is the last week of school in Turkey where I work full-time (ahem) teaching English – the time is right for sharing my news. MY NEWS: This is not just the last week of the academic year, if things work out this is also the last week of my teaching career. We are moving cities after the summer. Goodbye Istanbul, hello… Ankara. (Cue non-functioning party popper and stunned silence.) It’s not exactly the frying pan to the fire. It’s more frying pan to the pile of cold, grey ashes dumped behind the coal bunker. In partying terms, we’re moving from Turkey’s thumping, pumping heart to its brain-dead-head. The reasons are not particularly important. Just the deal I managed to thrash out over the negotiating table (surely dinner table, ed.) with she-who-must-be-dismayed. I only had one condition regarding a proposed relocation: we move I get to try writing full-time for a year. If I can physically and mentally hack it (easier dreamed about than done) and make it work for me as a lifestyle, I’ll try another year. If I can’t, I’ll be looking for another teaching job. (One thing about being a native English speaker with a teaching qualification, you never have to be out of work in this world.) I will be busting my behind trying to make it work. What do you know about Ankara? I’ll tell you what I’ve found out about the place in the half-a-dozen visits I’ve made over the years. It’s quite possibly the most boring capital city in the world. Apart from the little bit of old-town slum stuck somewhere in the middle, infrastructurally (if that isn’t a word it should be) and architecturally it’s intensely uninteresting, plain, without imagination or inspiration or flair or colour or definable style. It is dull and often oddly soviet in appearance. But it is functional, more orderly than Istanbul, quieter, cleaner and less frantic. Geographically: in the surrounding area there are no mountains, no forests, no great rivers. And it’s quite flat. A flat featureless landscape slowly being gobbled up by apparently unregulated, sprawling development in every direction; a gently expanding flow of concrete, glass and tarmac, like something from a futuristic magic-porridge-pot fable about the destruction of the environment. And being in the centre of the country there is no sea for about a million miles in any given direction. I think that will be one of the biggest challenges for me living there – no sea to stare at wistfully, to throw stones into, to fantasise about doing a Reggie Perrin with. I’m British. We need sea around us. As David Booker once said: it’s in our DNA. For anyone wondering about the objectivity of my take on the capital of Turkey, Ankara has more shopping malls per square yard than any other major city in the solar system, allegedly. That in itself is an indication of how little there is to do there. Well all that will suit me fine. I’m going there to work, to try to carve out a new way of life for myself, a new career. Distractions, I don’t need. I can do a year. This week, my family having decamped to Ankara for a few days, I have been home alone. I wonder if it can be imagined how much I was looking forward to having the place to myself and getting my head down over the laptop in an extended period of peace and quiet. R&M#6 beckoned. Monday: came home from work, opened a beer lay down on the sofa with a book because I could. Woke up at ten o’clock and went to bed cursing a wasted evening. Tuesday: came home from work, opened a bottle of wine and a family bag of crisps and watched crap TV on the sofa because I could. Woke up at ten o’clock and went to bed cursing a wasted evening. Wednesday: came home from work to find I’d run out of beer and wine. Went to the market to rectify that situation. Came home to find there wasn’t anything to eat. Went back to the market and did some shopping. Came home again a bit tired. Tried and failed to order take-away pizza in Turkish. Made a sandwich, opened a beer fell asleep on the sofa watching The Simpsons (that’s not crap TV). Woke up at ten o’clock and went to bed cursing a wasted evening. Thursday: woke up to find myself down to one clean shirt. Put washing on. Went to work. Came home from work to find I hadn’t turned the washing machine on. And shirts thick with detergent slurry. Washed one shirt in sink. Hung shirt in bathroom to dry. Went to kitchen to make dinner. Couldn’t find any clean cutlery, utensils, saucepans or plates. Dismantled mountain of washing up. Too tired to make dinner. Made a sandwich. Opened a beer. Fell asleep on sofa watching crap TV. Woke up at ten o’clock and went to bed cursing a wasted evening. Friday: woke up. Shirt still damp. Took ten minutes trying to get ironing board to stand up. Couldn’t find the iron. Went to work in damp, crumpled shirt. Came home. Had to tidy up because family back tomorrow. Too tired to make dinner. Opened a beer. Sitting on sofa watching crap TV wondering where the week went.